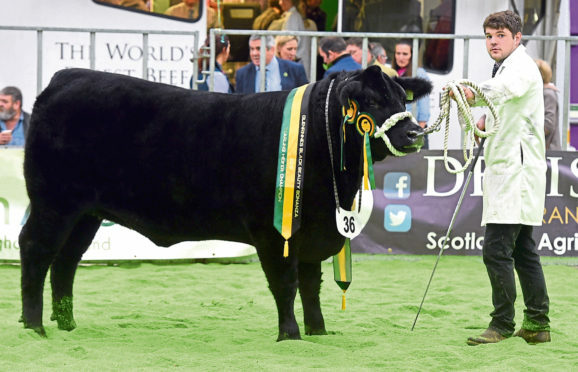 Honours were evenly spread out at the 20th Black Beauty Bonanza which attracted an outstanding entry of more than 100 Aberdeen-Angus calves and yearlings from 30 herds from Clackmannan to Ross-shire. Organised by the North East Aberdeen-Angus Club, with Glenrinnes Estate, Duffotwn, as main sponsor, the show was widely viewed by the large ringside audience as the best in the 20 years of the event and drew warm praise from the judge, Rob Bishop, owner of the noted Warrenho herd in Berkshire. Leading the entry of 53 bull calves born in 2018 was a promising January-born calf, Blelack Dakota, by Netherallan Peter Pershore, from regular winners at the event, NF Massie and Sons, Blelack, Dinnet, Aboyne, closely followed in reserve place by the March-born, Cardona Jeweliot Eric, by the North American sire, SAV Solid Gold, from Scotbeef managing director, Robbie Galloway’s Cardona herd at Doune. Yearling bulls were topped by the 20-month-old, Logie Dynamite, a well-grown son of Logie Electric, from AJR Farms, Mains of Collieston, Ellon, who acquired the Logie herd from the Bruce family last year, retaining Andrew and James Reid as cattlemen. Runner-up was the second prize-winner in the same class, the 20-month-old, Tonley Elijah, by Tonley Essien, from Sellars Agriculture managing director, Neil Wattie and son, Mark, from Mains of Tonley, Alford. Champion heifer calf was the January-born, Tulloes Pride, by the privately purchased Blelack Jock Eric, following her native breeds junior championship success at Stars of the Future, from first-time exhibitor, David Raeburn, Burnside of Tulloes, Letham, Forfar. Reserve, and again the second prize-winner in the class, was the January-born, Retties Evita, by Retties JFK, shown by Richard and Carol Rettie, Devonside, Clackmannanshire, from their herd at Methven, Perth. The Rettie’s had a successful day, bringing out the yearling heifer and reserve champions from their livery, on behalf of Donald Rankin, Kilmaluag, Duntulm, Isle of Skye, who took top honours with the 18-month-old Kilmaluag Lady Ruth, another by Retties JFK, with reserve spot going to the farthest travelled exhibitor – Brailes Livestock in Oxford though all the cattle are kept in Scotland – with the 18-month-old, Cheeklaw Black Beath, by Balmachie Lord Jack, bought at the Cheeklaw dispersal. The coveted McCombie Trophy for the best pair of calves went to Robbie Galloway with his reserve bull calf, along with a second prize April-born bull calf, Cardona Prize Fighter. Blelack was reserve with its champion, which was paired with the first prize April-born bull calf, Blelack Dual Mine, by Weeton Diamond Mine. Winner of the Shand Trophy for the best pair of yearlings was Hamish Sclater, Denhead, Dunlugas, Turriff, with two yearling bulls, Deveron Exstatic, by Gretnahouse Blacksmith, and the fourth prize, Deveron Joules Eric, by Deveron Master Banbury. Standing reserve were two by Retties Euromillions from Mr Rankin – the third prize heifer, Kilmaluag Lady Iris, and the unplaced bull, Kilmaluag Jack Eric. The new award for herds of 20 cows or fewer founded within the last five years went to Moray farmer and vet, Hugh Thomson and his wife, Cara, whose class placings included a red ticket with the April-born heifer calf, Tynet Diana, by Gretnahouse Blacksmith.